WHAT IS A FIBROID ? WHICH TREATMENT IN WHICH PATIENT? Today, the most commonly employed treatments for uterine fibroids are hysterectomy, myomectomy and UFE. Hysterectomy and myomectomy are performed by gynecologists while UFE, HIFU and percutaneous ablation are performed by interventional radiologists. Therefore, in a women with uterine fibroids, treatment options should ideally be discussed by a team of radiologists and gynecologists and the ideal treatment must be chosen for each patient by this team. If this is not possible, then an interventional radiologist who is experienced in nonsurgical fibroid treatments must always be consulted, especially if a radical operation like hysterectomy is recommended. The number of fibroids is one of the most important criteria in the determination of the treatment type. If the patient has a single fibroid and this explains her symptoms, this fibroid can possibly be removed with myomectomy and the problem will be solved by sparing the uterus. But this is not seen very often, because fibroids are generally multiple. In such patients, the higher the number of fibroids, the more difficult it will be to remove all of them, the more blood will be lost during the operation and the more likely an emergency hysterectomy will be necessary. Besides, sometimes it may be impossible to know which of the fibroids are causing the patient’s symptoms. In such cases, if the surgeon insist on myomectomy, the success rates may become lower and another operation may become necessary (this time usually hysterectomy) if the patient still has symptoms after myomectomy. By contrast, in such patients, all the fibroids can be easily and successfully treated with UFE by preserving the uterus (picture). The number of fibroids does not affect the way UFE is performed. UFE is performed exactly the same way in a patient with a single fibroid and in another with numerous fibroids. This is the most important advantage of UFE over other uterus sparing treatments such as myomectomy, HIFU and percutaneous ablation, in which, each fibroid have to be treated individually. In conclusion, in patients who has multiple fibroids, UFE should be the first line treatment. Another important criterion for treatment decision of uterine fibroids is their location. In general, UFE is effective in all fibroids regardless of their location in the uterus. 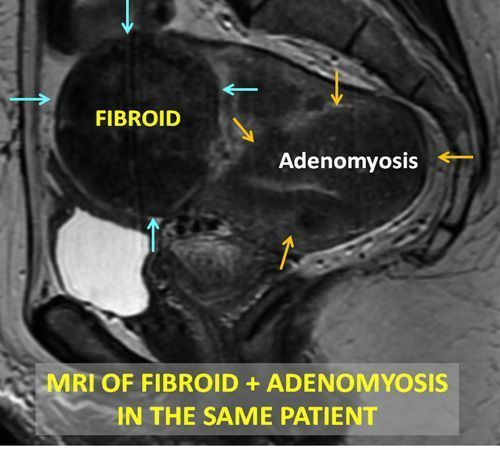 However, fibroids growing outward (subserosal) or into the cavity (submucosal), particularly if they have a small connection with uterus (pedinculated), may detach after the embolization and cause pain. By contrast, such fibroids can be removed with laparoscopic or histeroscopic myomectomy relatively easily since they have a weak connection with the uterus. Thus, in pedinculated subserosal or submucosal fibroids, myomectomy should be the first line treatment. For optimal use of these criteria, the number and locations must be demonstrated accuretely. 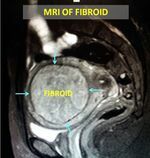 The most commonly used imaging methods to demonstrate fibroids are ultrasound and MRI. Ultrasound is cheap, easy to use and more widely available. However, MRI is clearly superior to ultrasound in imaging uterine fibroids; it can show both the number and location of fibroids much better, differentiate the live, degenerated and dead fibroids and demonstrate other pathologies that may coexist with or mimic fibroids such as adenomyosis and endometriosis. 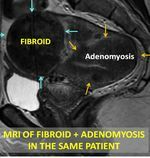 For this reason, it is extremely important that all fibroid patients undergo a “contrast enhanced pelvic MRI” before any treatment decision is made. If a patient with fibroids is diagnosed to have a biopsy-proven cancer in her uterus or ovaries, then the ideal treatment is hysterectomy and oopherectomy (removal of ovaries). Likewise, if a patient with fibroids has also a familial tendency for ovarian cancer, then her ovaries and sometimes her uterus can also be surgically removed. And finally, if a patient with fibroids is considered very likely to have uterine or ovarian cancer based on her symptoms and MRI or PET-CT findings, she may undergo hysterectomy and oopherectomy. However, apart from these rare situations, it is scientifically not approved to perform hysterectomy in an otherwise normal fibroid patient just to protect her from an ovarian or uterine cancer that might develop in the future. Because, a number of studies have proven that in patients who underwent hysterectomy, the probability of coronary heart disease is increased about 3 times, and even much more if the ovaries are also removed during hysterectomy. In a patient of reproductive age, the possibility of death from an ovarian or uterine cancer is less than 1% for the rest of her life, while that from cardiovascular disease is roughly 50%. Thus, in a usual patient with fibroids, hysterectomy/oopherectomy does not increase life expectancy, instead, it is very likely to shorten it by increasing the probability of cardiovascular disease. In fibroid patients who undergo hysterectomy, additional problems may also be seen including osteoporosis, bone fractures, dementia, depression and psycosexual disorders. For these reasons, excluding a small group of patients with proven or highly probable uterine or ovarian cancer, hysterectomy must be avoided whenever possible in the treatment of uterine fibroids. Among the treatment options for fibroids, hysterectomy eliminates the possibility of pregnancy permanently and therefore, should not be recommended to fibroid patients who want to be pregnant in the future. In patients who wish to preserve fertility, current treatment options include embolization, myomectomy, HIFU and percutaneous ablation. Among them, the most commonly employed treatments are embolization and myomectomy. Both treatments have advantages and also disadvantages in fibroid patients who want future pregnancy. In a recent study, pregnancy rates after embolization have been found similar. Thus, in fibroid patients who wants pregnancy, any of these two treatments can be recommended depending on the fibroid number and size, and the preference of the patient or doctor. However, it must always be remembered that pregnancy depends on multiple factors and no treatment for fibroids can guarentee pregnancy even if it was performed successfully. In many fibroid patients, more than one treatment option may be suitable. In this situation, the physician must inform the patient on the advantages and limitations of each treatment option and let the patient decide about the fate of an organ that belongs to her own body.